where c is a constant and 2 is the so-called scaling coefficient. There are grounds for expecting values of 2 to lie between 1 and 2 (Murdoch & Stewart-Oaten, 1989) and most observed values seem to do so (Cottingham et al., 2001). In this range, population variability increases with species richness (Figure 20.8) - a connection between complexity and population instability, as found in May's original model. Even if complexity and population instability are connected in models, this does not mean that we should necessarily expect to see the same association in real communities. For one thing, the range and predictability of environmental conditions will vary from place to place. In a stable and predictable environment, a community that is dynamically fragile may still persist. However, in a variable and unpredictable environment, only a community that is dynamically robust will be able to persist. Hence, we might expect to see: (i) complex and fragile communities in stable and predictable environments, and simple and robust communities in variable and unpredictable what should we expect to see in nature? environments; but (ii) approximately the same recorded stability (in terms of population fluctuations, etc.) in all communities, since this will depend on the inherent stability of the community combined with the variability of the environment. Moreover, we might expect manmade perturbations to have their most profound effects on the dynamically fragile, complex communities of stable environments, which are relatively unused to perturbations, but least effect on the simple, robust communities of variable environments, which have previously been subjected to natural perturbations. (low resilience). The r-selected populations, by contrast, will have little resistance but a higher resilience. The forces acting on the component populations will therefore reinforce the properties of their communities, namely fragility (low resilience) in stable environments and robustness in variable ones. A number of studies have examined the relationship between S, C and P in real communities, following the prediction summarized in Equation 20.1. The argument they use runs as follows. The communities we observe must be stable - otherwise we would not be able to observe them. If communities are only stable for P(SC)1/2 < 1 (or at least when the left-hand side of the inequality is low), then increases in S will lead to decreased stability unless there are compensatory decreases in C and/or p. It is usually assumed, for want of evidence, that P is constant (though ecologists are rising to the challenge of quantifying interaction strengths -e.g. Benke et al., 2001). Thus, communities with more species will only retain stability if there is an associated decline in average con-nectance, C. We should therefore observe a negative correlation between S and C. A group of 40 food webs was gleaned from the literature by Briand (1983), including terrestrial, freshwater and marine examples. For each community, a single value for connectance was calculated as the total number of identified interspecies links as a proportion of the total possible number. Connectance is plotted against S in Figure 20.9a. As predicted, connectance decreases with species number. However, the data in Briand's compilation were not collected for the purpose of quantitative study of food web properties. Moreover, the level of taxonomic resolution varied substantially from web to web. More recent studies, in which food webs have been much more rigorously documented, indicate that C may decrease with S (as predicted) (Figure 20.9b), that C may be independent of S (Figure 20.9c) or may even increase with S (Figure 20.9d). Thus, no single relationship between complexity and stability receives consistent support from food web analyses. what is the evidence from real communities? the range to which it is adapted, then as richness increases, so too will the likely number within the acceptable range. In this more realistic case, connectance would be roughly constant. Moreover, if webs are made up of specialists, overall con-nectance will be low, whereas webs composed of generalists will have high connectance. The proportion of specialists may change with richness. Thus, the inconsistency of pattern may simply reflect a diversity of forces acting on different webs. The prediction that populations in richer communities are less stable when disturbed can also be investigated experimentally. One classic study, for example, monitored the resistance in two grassland communities (McNaughton, 1978). In the first, plant nutrients were added to the soil of a community in New York State; in the second, the action of grazing animals was manipulated in the Serengeti. In both cases, the treatment was applied to species-rich and species-poor plant communities, and in both, disturbance reduced the diversity of the former but not the latter (Table 20.1). This was consistent with the prediction, but the effects, while significant, were relatively slight. 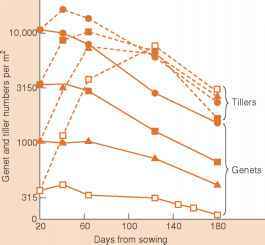 Similarly, Tilman (1996) pooled data for 39 common plant species from 207 grassland plots in Cedar Creek Natural History Area, Minnesota, over an 11-year period. 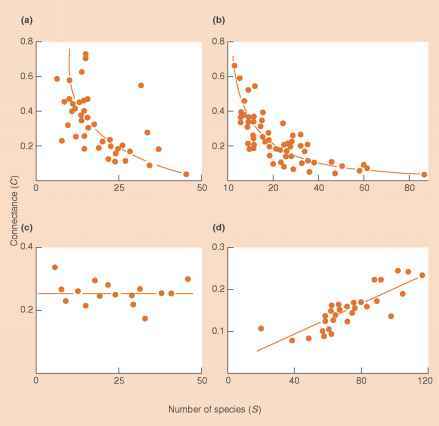 He found that variation in the biomass of individual species increased significantly, but only very weakly, with the richness of the plots (Figure 20.10a). Finally, there have been a number of studies directed at the question of whether the level of 'perceived stability' of natural populations (interannual variation in abundance) varies with the richness or complexity of the community. Leigh (1975) for herbivorous vertebrates, Bigger (1976) for crop pests and Wolda (1978) for insects, all failed to find evidence that it did so. Overall, therefore, like the theoretical studies, empirical studies hint at decreased population stability (increased variability) in more complex communities, but the effect seems to be weak and inconsistent.